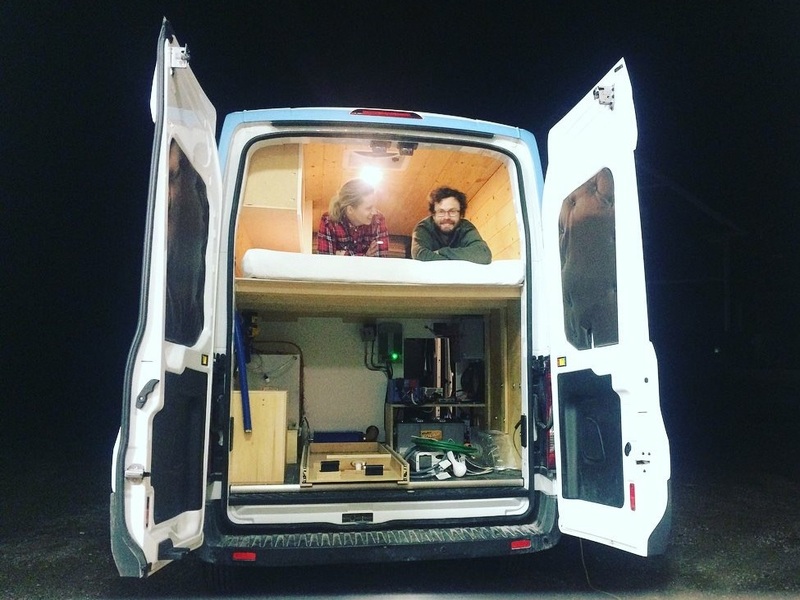 The entire van was built around the idea that we wanted to store our mountain bikes and utilities inside. This meant we would for sure have a fixed bed. Long before the process of finishing the interior began, we had put the necessary supports in place to ensure we could complete a strong platform that would sit securely above our ‘garage’ of gear. Strapping was secured to the walls by bolting to previously installed rivnuts, and felt was glued between the strapping and the plywood ‘wall’ to stop any potential squeaks down the road. Resting on top of the strapping, we screwed down ‘C’ shaped ribs that sat precisely on the top of the straps and spanned the width of the van. Last, half-inch plywood was laid in two pieces atop the ribs, a plywood wall secured between the garage and living quarters, and the foot and head of the bed were finished with four-inch wide pieces of beautiful glossy oak. Underneath the bed platform, along the ‘ribs’ or ‘beams’ we later reinforced two points to take up a slight bend. Two interior walls built for storage also provided additional structure to the platform. The garage has gone through extreme low and high temperatures and a few minor re-builds to optimize space, but it has yet to let us down - physically or metaphorically. The bed itself is a 4-inch queen-size mega dense memory foam mattress ordered off of Wayfair. We put a mattress protector around it from day one and put a layer of Hypervent beneath it for airflow. We use a normal queen-size fitted sheet and are quite cozy at night under our down duvet. A note must be made, however, that ten inches of the mattress was cut off the end to create our bench seat cushion - making us just shy of a full queen bed. Ryan is 6 feet tall so his feet hang off the end… but he likes it that way. Win-win. If we did it all again? It would be great to have a bed that converts to seats and a table. It would open things up a LOT. We would have to get a lockable box for the bikes and a North Shore rack (or similar) not to mention an aftermarket tow kit ($$$). All in all, we’ve enjoyed the security of having everything locked up inside, our bed is pretty comfy, and we don’t have to convert the bed base twice every day. This was one of the toughest and most time-consuming parts of building the van. The cabinets had to be light-weight, durable, simple to construct and replace, painted, attractive, not annoying to use, fit everything we need precisely… oh… and fit against a round wall. Not just round up and down, Also round side-to-side. 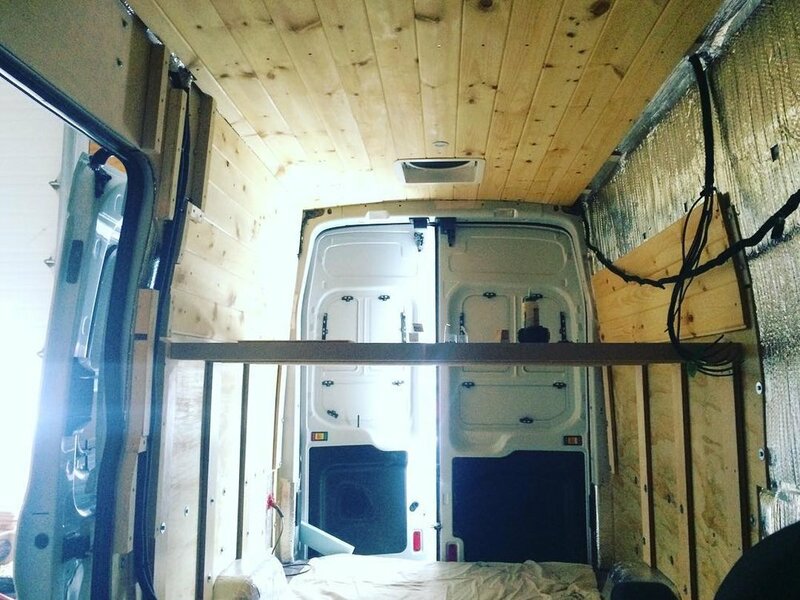 Anyone that has installed cabinets for a van conversion will tell you more than you want to know about how hard it can be. Nevertheless, we did it. 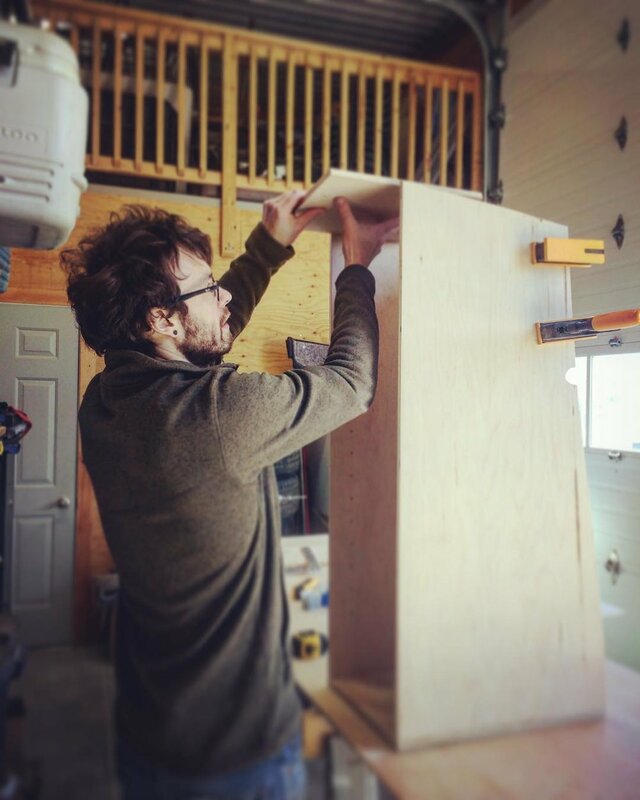 We used half-inch plywood to create a tidy, simple, but attractive set of shelves and a drawer to house our galley kitchen, our closets, and create a bench seat. 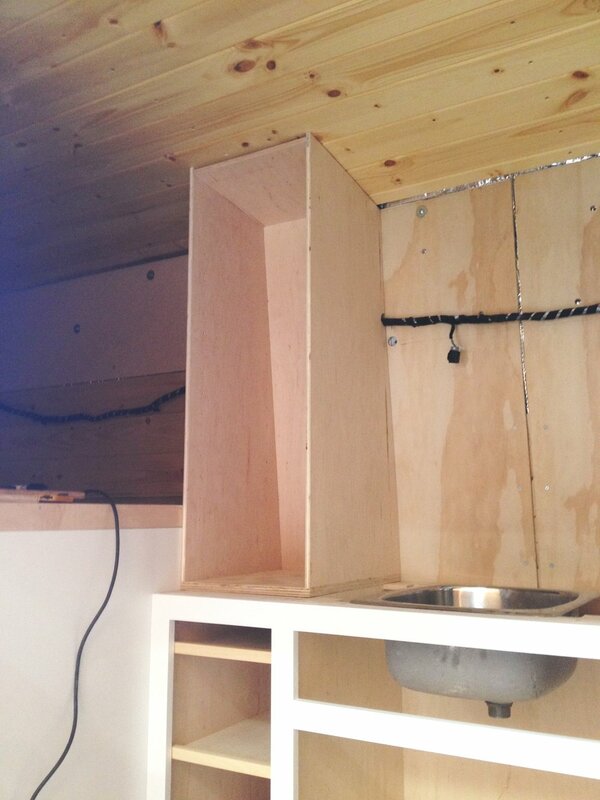 Most are mounted on our rivnut system, and the bench we screwed to the (plywood) floor. 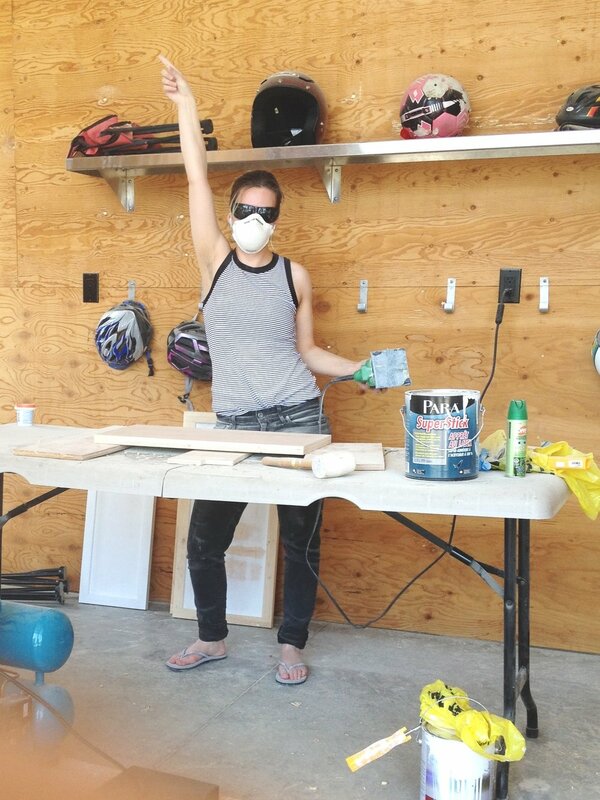 We sanded all of the outer faces and painted them white. The insides were sealed with two layers of a water-based ‘Min-Wax’ product. We added shelves and a drawer, cavities for the fridge, range, and sink, and used baskets to keep everything together and tidy. We each have a tiny cabinet with a magnetized door - just big enough for our clothing - and the bench - originally meant to house a composting toilet - was repurposed to hold our laundry, out-of-season boots, and a few other odds and ends. So far, we have found that the space we built works great for us. As a rule, we would say, the more storage the better. Then again, the less storage you have, the less you will lug around or accumulate. There’s a balance in there somewhere. I think the amount of stuff you have to store on the bed during the day might have something to do with it.